Tabor Hill Grand Mark Sparkling Wine NV | Wine Splash! We fell in love with the Tabor Hill Grand Mark sparkling wine years ago and consistently purchase a few bottles a year for our family celebrations. This sparkling is done in Brut style and is made from hand picked Pinot Noir and Chardonnay Grapes. It was voted Michigan Best Sparkling Wine in 2007 and has won Best in Class! We picked up a few bottles last July and opened one this weekend for a family birthday party. On sight, daybright yellow with lots of lively bubbles. The nose had aromas of fresh apples, citrus, and toast. Over the palate, the wine was medium bodied, effervescent, with a good acid structure. Flavors of Macintosh Apples, citrus, and a bit of toast on the finish. Nice mouthwatering finish that is clean, refreshing, and lively! A great sparkler for appetizers like medium cheeses, shrimp cocktail, raw vegetables and dip, or fruit. Would also pair well with a fresh salad, chicken, seafood, or roasted turkey. This is a Michigan sparkling wine with character and class. The taste tells you it was made with loving care by a winemaker passionate about wine. We give the Tabor Hill Grand Mark Sparkling Wine 88 Points and feel it still is one of the best coming out of Michigan! 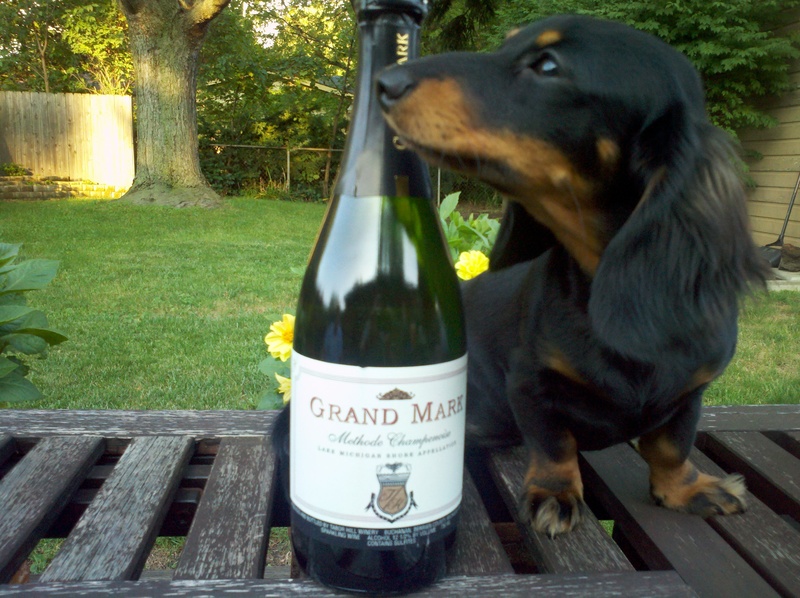 WineDox Daisy give the Grand Mark 3 Paws out of 4 Paws. This is a Non Vintage (NV) sparkling wine so there is no vintage date. They are usually released when the winemaker feels they are ready to be opened. So if you have a Grand Mark in your cellar, we suggest you drink it within a year of when you purchased it. Besides, its fun to go to Tabor Hill Winery and restock anyway! WineSplashing! !